Face cleanser. You scrub it on and rinse it off. Surely in those 30 seconds it can’t harm your skin, right? Think again. 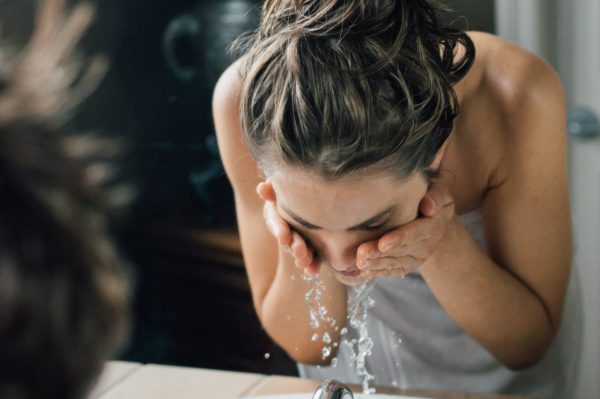 While it’s true that rinse­off products don’t sit on your skin as long as things like, say, moisturizers—limiting your exposure to potentially harmful chemicals—that’s only part of the story. The simple act of cleaning your face could set you up for premature aging. In fact, you may be surprised to learn that your cleanser is the most important product in your skin care regimen. Before you put on your facial oil, moisturizer or your anti­-aging treatment, you need clean, refreshed skin, or that next product just won’t work as well. Unfortunately, many of today’s popular cleansers not only fail to clean well, but they can actually damage your skin, encouraging dryness, dullness, and the appearance of fine lines and wrinkles. Your cleanser could be aging your skin! You’ve probably heard about pH balance in the skin, and how some products can disrupt it. But what is pH balance? Travel back in time to your high school chemistry class and you may remember that pH means “potential hydrogen.” (Don’t feel badly if you don’t—most of us were snoozing.) Scientifically, it measures the hydrogen ions in a concentration. You can think of it as an abbreviation for “power of hydrogen.” More simply, it’s a measurement of the acid-­alkaline ratio of something, which ranges from 0 (the most acidic) to 14 (the most alkaline). The number “7” is considered the mid­point. Anything above 7 is more alkaline, and anything below more acidic. Those elements with a pH of 7 are considered neutral—like pure water, which has a pH of 7. Milk of magnesia is an alkaline substance with a pH of 10, which is why it helps soothe an acidic stomach. Any time you bring substances at opposite ends of the scale together, they can help balance each other. Vinegar has a pH of 3, making it more acidic than water. This is why it helps dissolve things like hard water deposits. Soda pop has a pH of 2.5, making it more acidic—which is why it can wear away your tooth enamel. Baking soda is highly alkaline, and can help balance out acidic substances. What does pH balance have to do with your skin? Like most things, your skin has a preferred pH level where it is most healthy and vibrant. The skin’s outer layer, for example—which keeps in lipids and moisture—works best when it’s slightly acidic, at a 5.5 pH level. When the outer layer is too alkaline, it gets dry and sensitive, which can lead to fine lines, wrinkles, dullness, and even skin problems. A 2010 study published in the British Journal of Dermatology reported that after eight years, women with an alkaline outer layer developed more fine lines and crow’s feet and were more prone to damage than those with more acidic skin. On the other hand, skin that is too acidic isn’t happy either. It’s likely to respond with increased breakouts, and may feel raw, irritated, and sore. Balancing skin pH is a great way to delay the signs of aging and encourage vibrant, youthful ­looking skin. Unfortunately, many of us mess up the pH balance first thing in the morning when we clean our faces, setting the stage for premature aging. Even if you’re doing everything else you’re supposed to do, including applying sunscreen, facial oil or moisturizer, and anti-­aging treatments, if you don’t have the right cleanser, you could be wasting your money! Determining which side your skin is on can help you discover what’s going wrong in your skin care. Of course, if your skin is vibrant, dewy, and perfectly moisturized, you’re well balanced and have nothing to worry about. Very few of us fall into that category, however! Why is your cleanser so important to your skin’s pH? Because surfactants—the ingredients in your cleanser that clean skin—can easily disrupt the pH. Soap that is too alkaline, for example, can break up the acid in your skin, causing dryness. That’s why we recommend you don’t use soap to clean your skin as most are too drying with pH levels between 9-­12. Once you disrupt your skin’s pH with soap, it can take hours to restore itself, leaving your skin vulnerable to aging during that time. The pH level of most cleansers is slightly higher than 5.5—your skin’s preferred level—so they can break down dirt and oil. They have to be slightly different to be effective, but the balance is critical. Those that are too alkaline may get your skin clean, but they will also strip your skin of its natural oils, causing dryness, dullness, irritation, and wrinkles. There is a very fine line between creating the perfect cleanser­ one to be completely balanced and in harmony with your skin. Start using the right cleanser now, and you will be on your way to beautiful healthy skin. Oh, and by the way—ignore the words “pH ­balanced” on a product. It’s just marketing hype, as most soap-­free cleansers are pH­ balanced. How can you tell if a product will clean your skin without damaging it? The next step—watch out for harsh ingredients. We talked about sodium laureth sulfate and sodium lauryl sulfate in a former post. These are two popular ingredients used in skin care products, but they’re too harsh and drying. Their pH levels are around 10, which means they can strip the skin’s natural oils and create dryness, particularly if you use them every day. On the other hand, ingredients like alpha hydroxy acids and amino fruit acids can help exfoliate and deep ­clean, but they can also be overly acidic, which can disrupt the lipid barrier in skin and even weakens skin’s natural defenses to environmental pollution. Looking at the ingredient deck on your products will help you choose more nourishing, tender cleansers. The best gauge for how your products are working, however, is your skin! If it feels dry, dull, and irritated, your cleanser may be too alkaline. If it’s oily, red, sensitive, or breaking out, your cleanser may be too acidic. Note that you’ll likely find differences in your skin as you age, as well. What worked for you when you were in your 20s probably won’t work as well anymore. Skin naturally gets dryer as we age, as it doesn’t produce as much natural oil. The outer layer also becomes damaged, and is less able to hold onto moisture. It all comes down to a delicate balance between you, your skin, and your products. At Annmarie Skin Care, we use nourishing plant ingredients that clean your skin without being too harsh or too drying. Our cleansers also include protective antioxidants and restorative moisturizers. When you start your day off with a perfectly balanced cleanser, like our Citrus Mint Cleanser or Aloe Herb Cleanser, you’re helping your skin to appear more vibrant and smooth while keeping it clean and refreshed. While most cleansers for oily skin strip the excess oil with each use, the Citrus Mint Cleanser helps to balance oil production over time. It's important to understand the role of pH in your skin care to choose the best natural, anti-aging cleanser for your skin! How does your skin feel after using our Citrus Mint Cleanser? We would love to hear your story! In the clues of acidic / alkaline skin, I found that I had a few factors of both? Excellent article. Super information for us all. Also the aloe vera is one of the ingredients that is helps immensely to repair the skin after it is burned by the sun or hospital treatments. Good choice for your cleanser. Thank you. So happy you enjoyed the article. Thank you Judy, we just love Aloe in all it’s forms :). And it is so silky in our cleanser and leaves skin radiant. Make it a wonder-filled day :). I know for a fact that the Aloe Herb cleanser has totally brought my skin back to it’s proper balance and my once extremely uncomfortably dry skin is now normal! :) Thank you Annmarie! !